William Arnee Frank (1808-1897) was Joseph Austin Benwell's first cousin, being the son of Hannah Benwell (Joseph Benwell senior's elder sister) and Arnee Frank (1776-1859), a well-respected Bristol Quaker. He was born on 5 July 1808 at Church Lane, Bristol. Both William Arnee Frank and Joseph Austin Benwell were grandsons of John Benwell of Sidcot. He married Martha Willmott (1815-1896) of North Pensford, Somerset in 1840, and they had five recorded surviving children. In the 1871 census, his wife Martha is also described as a 'painter in watercolours'. William Arnee Frank was also an artist who quite early in his life, in 1831, published a series of lithographs of Bristol views, now held at the Fitzwilliam Museum, Cambridge. A number of his works are held at Bristol Museum and Art Gallery . 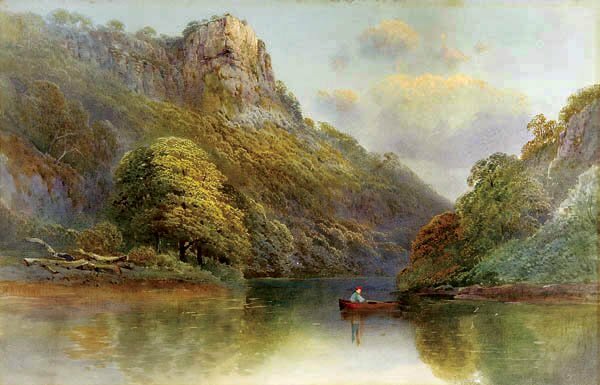 Like Benwell, later in life he produced many watercolours, mostly of landscapes in England and Wales. 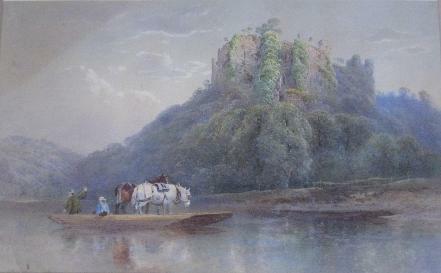 These two watercolours of Goodrich Castle in Herefordshire are interesting in that both show similar scenes of an old ferry boat with figures crossing the River Wye, and Goodrich Castle in the background. The 1882 painting shows a man (the ferryman) in hat and brown coat paddling the boat, with two horses, one brown and one white with blinkers standing in the boat. A lady in a shawl with a basket is waiting under a tree on the river bank. The second painting shows the ferryman- a man in hat and brownish-green coat paddling the boat in a different pose (likely the same man? ), with another man in white hat, blue shirt and braces sitting on the edge of the boat. There are no figures on the river bank. The first picture appears to show the castle from a slightly greater distance, with trees and figure in the right mid-foreground. Close-up of figures and boat, second painting. In this image, the brown horse is looking towards the artist, and appears to have a white blaze on its head. The ferryman is wearing a brownish-green coat and is standing in a different position. There is a passenger in white hat, blue shirt and braces in this image. Cattle Ferry on the River Wye near Symonds Yat. I wonder if the painting of Skiddaw is still there?, over a hundred years after this book was written and over 150 years since it was painted. This painting was sold at auction in 2013 described as depicting a loch with hills in the background. The painting could be a scene from Scotland, or it could be a scene in North Wales or the Lake District. Should anyone recognise the scene or have any thoughts as to where it is, please do contact me (contact tab above). There appears to be a white/grey church spire right centre of the picture, below the hills. The topography, small wooded island and the church spire (as opposed to tower or chapel), indicate that the location is more likely to be the Lake District than North Wales. Possibly Keswick/Derwentwater? The church in Keswick (St John) has a spire and is in a prominent position in the town. The mountain in the background could therefore be Skiddaw, possibly depicted in a rather exaggerated and romanticised manner as favoured by some Victorian landscape artists. If this painting does show Skiddaw, it is clearly dated 1879 and therefore cannot be the one referred to in the Sidcot book extracts above, which must have been painted prior to 1864! See below - shown side-by-side for comparison. This watercolour is inscribed with the title on its reverse side. It is signed, but does not appear to be dated. It is interesting to compare with W A Frank’s earlier lithograph of the same name. As mentioned previously, W A Frank produced engravings and lithographs early in his life (before the 1850s), focusing on watercolours later in life. 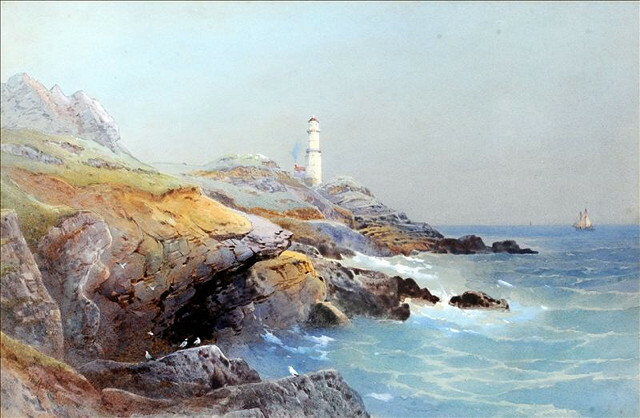 It is therefore likely that the dates of the lithograph and watercolour differ by several decades, unless the watercolour is one of Frank’s very early paintings. The two images are captured from a slightly different perspective and distance, but otherwise are unmistakably of the same scene, The broken tree stump leaning out mid-foreground right centre in the painting could be the remains (years later) of the similarly shaped and located small young tree shown in the lithograph. 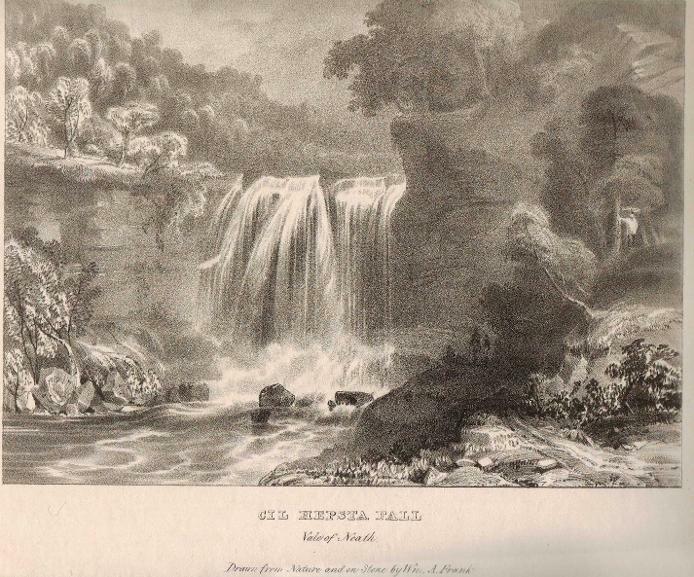 The location is now better known as the Upper Cilhepste Fall (or Sgwd yr Eira) in the Waterfall Country of Brecon Beacons National Park. ‘Cil Hepsta Fall, Vale of Neath’ lithograph c. 1830-1850 ‘Drawn from nature and on stone by Wm A Frank' - larger image. Now known as Sgwd Yr Eira Waterfall. It is possible that this lithograph could be from the folio ‘Ten Views in Wales’ published in 1830, as the written description under the image includes the words ‘Drawn from nature and on stone by Wm A Frank’, as do other known plates from the folio. William Arnee Frank was a pupil at Sidcot School 1818-1821, and four of his children attended the school in the early 1860s. This lithograph was made before the Clifton Suspension Bridge was built. Work started on 23 June 1831 (a small ceremony was held) and it took 33 years to build. The Bridge was opened in 1864. W A Frank may have wanted to record the scene before work started.